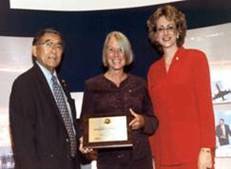 Silver Enterprises was founded in 1995 by its proprietor, Anne McGuire, in Fairfax, Virginia. The company initially was engaged in part time projects involving technical training consulting with federal agencies. In 1996 the company was the successful bidder to supply railroad boxcars to the US Army. From that time to the present, Silver Enterprises has continued to work in both the technical training and railroad equipment fields. In September 2000, Robert McGuire joined the company, further expanding the company’s capabilities in both the railroad equipment and training activities. Silver Enterprises’ largest project to date is a $13.6 million contract for the manufacture and delivery of 151 railway flat cars. Silver Enterprises assembled an outstanding team to perform the design, manufacturing, and quality assurance processes. Primary design and production tasks were performed by Thrall Car (now Trinity Industries after its merger with Trinity Rail). Manufacturing was at Cartersville, GA and cars were shipped to Ft. Sill, OK; Ft. Campbell, KY; Ft. Bliss, and Ft. Hood, TX. The Silver Enterprises team also included senior engineers and other experts who inspected the railcars during production and assisted in the resolution of technical issues. Silver Enterprises is a graduate of the US SBA 8(a) Business Development Program and is certified by the SBA as a Small Disadvantaged Business (SDB). Silver Enterprises is also certified by the State of Florida Department of Transportation as a Disadvantaged Business Enterprise (DBE). 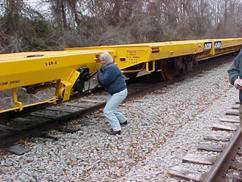 Anne McGuire sets handbrake on Army flatcar.